Former permanent resident. Now introduced; no wild populations. The Northern Bobwhite was very rare during the Minnesota Breeding Bird Atlas (MNBBA). The Northern Bobwhite is found primarily in the Great Plains, in the eastern tallgrass prairie, and throughout the southeastern United States. Its midwestern population is sparse north of southern Iowa, and the species is rare to absent along the Appalachian Mountains. This game bird is well studied in the United States, and 22 subspecies have been described. Highest densities have been observed in western Oklahoma and southern Texas (Figure 1). Assigned a Continental Concern Score of 12/20 and designated a Common Bird in Steep Decline by Partners in Flight. Permanent resident where it exists. Consumes primarily plants and seeds with varying amounts of arthropods. On the ground in a shallow depression lined with grass or leaves and with protective vegetation above. Breeding distribution and relative abundance of the Northern Bobwhite in North America based on the federal Breeding Bird Survey, 2011–2015 (Sauer et al. 2017). In Minnesota, this quail’s history and status are not easy to unravel. There are three periods to consider. First is the early exploration and presettlement time. Next are the decades of opening up the wooded prairie margin to farms and, at the same time, extensive introductions of game-farm birds and a possible expansion of populations from the south. Lastly, in recent decades, after agency releases were halted in the 1950s, better survey methodologies were utilized, and knowledge improved about the Northern Bobwhite in Minnesota. Roberts (1932) summarized the absence of quail at presettlement time: “The various explorers into the country that is now Minnesota in the early part of the nineteenth century (Keating and Thomas Say of the Long Expedition, Schoolcraft, Featherstonhaugh, and others), who mentioned both game- and non-game birds, have nothing to say about seeing Quail.” Surveys and mapping from 1960 to 2015 indicate that there is not now a viable breeding population, and birds seen in the field are most probably released or escaped. This species now is essentially extirpated as a wild species in Minnesota. During the period from settlement to the 1950s, the status of Northern Bobwhite is quite murky, as will be evident from what follows. Frequently we find in the periodicals or in the daily press references to the introduction of Bob-white or quail . . . into Minnesota, and it seems to be quite generally known that the bird is not native to the state, but it has been brought in by interested sportsmen. However, when a search is made for actual records of birds introduced these references are for the most part found to be conspicuous for their lack of definiteness and real value. There are a few bits of more explicit information. One that Swanson (1929) discussed concerned the captive-reared birds that were released near Fort Snelling sometime around 1840. It is assumed that they did not persist. Roberts gives some facts about quail reported in the 1880s and 1890s, most particularly notes from Dr. Hvoslef of Lanesboro, Fillmore County: “Last winter, 1892–1893, I again saw a few flocks of Quail after it had been almost entirely absent for several years, and during the summer of 1897 I saw quite a number.” Roberts reported several other counties with records during that time: Houston, Lincoln, McLeod, and Waseca. Roberts goes on to say that “from this time on the Bob-white became a regular, established bird in southern Minnesota.” It was assumed that these birds were from an expanding native population in northern Iowa that resulted from favorable land-use changes from farming and spells of good weather. Roberts mentioned other counties where from the late 19th century up until 1915 there were “various attempts of the Quail to gain a foothold in northern Minnesota,” including in the Red River valley (Clay, Marshall, and Polk Counties), near Mille Lacs Lake (Aitkin, Crow Wing, and Mille Lacs Counties), and Otter Tail and Todd Counties. He concluded that “it is not likely that a half-hardy, non-migrating bird like the Quail can ever become established in this land of deep snows and continued low temperatures.” It is unknown whether these birds were a native expansion or from reintroductions. Interestingly, Aldo Leopold did game surveys in several midwestern states and mentioned that Pine County had many quail in 1896–98 after the Hinckley fire of 1894 (Leopold 1931). These birds appear to have expanded from Wisconsin. Regardless of how Northern Bobwhites came to occupy Minnesota in these early years, the population was sufficient to establish a hunting season from the 1920s through the early 1950s, when hundreds of birds were estimated to have been killed each year (Chesness 1964). According to a recent report by the Minnesota Department of Natural Resources, the bobwhite had been hunted since 1858, and the first recorded harvest was in 1919, estimated at 6,100 birds. The report concluded that during the 1920s, the estimated harvest peaked in 1927 (13,000 birds) and by 1932 it was confined to the southeastern area (Minnesota Department of Natural Resources 2015). Most of the nesting records given by Roberts were also from the 1920s. During this time period, the Minnesota Department of Natural Resources Division of Game and Fish was also releasing quail, but where, when, and how many are not known. These releases were terminated in 1952. As the numbers of harvested birds declined, hunting was also stopped in 1958. From an analysis of the current situation of the Northern Bobwhite in Minnesota, Hertzel (2003) concluded that “most Northern Bobwhite reported in Minnesota during the past 25 years are probably released or escaped birds.” He goes on to report that there are 75 game farms that have Northern Bobwhites, as well as private breeders, citizens, and farmers who could be releasing hundreds of birds. There are no state requirements to report where these releases are made. In the yearly observations reported to the Minnesota Ornithologists’ Union (MOU) seasonal reports from 1970 to 2005, some indicated that the birds were present but becoming scarce and some were tagged as “escapes.” Breeding evidence was mentioned from Castle Rock, Dakota County, and there were several reports from Blue Mounds State Park, Rock County, from 1981 (Millard 1981) through 1988, including “nesting” in 1982. These latter observations indicate a possible wild population may be dispersing from South Dakota. Many of the MOU records in the latter years of the 20th century appear to be single, random observations from 20 different counties. However, most of the observations in those decades were from traditional places in Fillmore, Houston, Wabasha, and Winona Counties. No more MOU records were posted after 2004, when the Northern Bobwhite was removed from the MOU Regular List and reclassified as extirpated “because all records are presumed to be escaped or released individuals, unless there is documentation with a record to suggest wild origin” (Eckert 2004). Breeding distribution of the Northern Bobwhite in Minnesota based on the Breeding Bird Atlas (2009 – 2013). Summary statistics for the Northern Bobwhite observations by breeding status category for all blocks and priority blocks (each 5 km x 5 km) surveyed during the Minnesota Breeding Bird Atlas (2009-2013). The landscape habitat in the areas where Northern Bobwhites have a natural sustainable breeding population is well known and described (e.g., Brennan et al. 2014). The species uses early-successional habitat of open, diverse patchy vegetation in agricultural lands, mixed forests, plantations, brushy savannas, and semi-natural suburban landscapes. Large open prairies or dense planted grasslands (switchgrass) are not suitable, nor are closed-canopy forests. Where populations are persistent, a landscape of patchy fragmented vegetation is most important. The U.S. and Canadian (though almost exclusively U.S.) population of the Northern Bobwhite is estimated by Partners in Flight as 5.8 million birds (Rosenberg et al. 2016). This is a considerably larger population than any of the other five western quail species, which also have much smaller ranges. 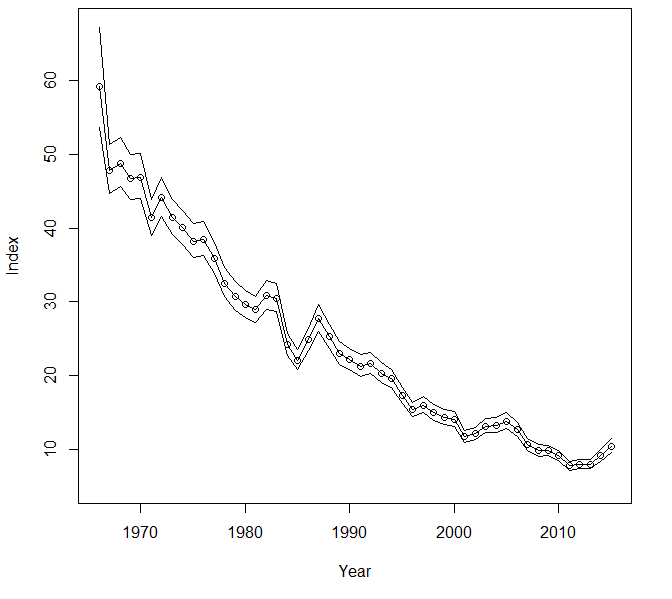 Trends from the federal Breeding Bird Survey (BBS) show a significant and drastic decline in the United States of 3.48% per year from 1966 to 2015 (Figure 3). There were also severe, significant declines of 5.38% per year in the Eastern BBS Region, and a significant decline of 2.61% per year in the Central BBS Region (Great Plains from the Dakotas to Texas). Rosenberg et al. (2016) estimated a cumulative 83% decline in the Northern Bobwhite population in the United States and Canada from 1970 to 2014. These severe population declines have given wildlife management agencies a strong cause for alarm (Sauer et al. 2014). In Minnesota, during the BBS time period (1967–2013), the Northern Bobwhite was so rarely reported that no trend can be determined; 8 out of about 85 survey routes (not all are run regularly) observed 1 to 3 bobwhites in 13 years. These routes were scattered throughout the southern half of the state, and the reports do not include anything about wild versus released birds. Breeding population trend for the Northern Bobwhite in United States for 1966–2015 based on the federal Breeding Bird Survey (Sauer et al. 2017). The Northern Bobwhite has been assigned a Continental Concern Score of 12/20 and designated a Common Bird in Steep Decline by Partners in Flight (Rosenberg et al. 2016). The scores were largely driven by the species’ drastic population decline and threats to its breeding population. There are multiple reasons postulated for the decline, most prominently the change in agricultural land-use practices from small farms to large agribusinesses. The patchy landscape with hedgerows, brushy edges, and native grasslands created by small farms has been lost and replaced by efficient large-field monocultures (Brennan et al. 2014). Restoring bobwhite populations requires restoring habitat on both public and private lands where possible. Two conservation organizations are working on that goal. Quail Forever was founded in 2005 with the strategy of creating habitat projects on a local scale. The National Bobwhite Conservation Initiative was proposed in 2002 and developed as an organization of state wildlife agencies and conservation organizations from 25 states. They have created a Coordinated Implementation Program to help states adapt the national strategy to the local level. The plan covers states from Nebraska east to Pennsylvania and south to Florida and west to Texas. It does not include Wisconsin, Minnesota, or northern Iowa, where native quail populations no longer exist. In Minnesota, although there has not been a hunting season since 1958, the legal classification of the Northern Bobwhite is as a game bird (2016 Minnesota Statutes 97A.015, Subd. 24). Since there is not a hunting season now, there is essentially no management; nor is there a state program that regulates, surveys, or monitors the quail that are here. In 2014, the state legislature, prompted by the two Quail Forever state chapters, required that the Minnesota Department of Natural Resources do a “Feasibility Study for the Restoration of Wild Northern Bobwhite in Minnesota.” This thorough study (Minnesota Department of Natural Resources 2015), currently in draft form, includes a historical summary of what is known about quail in Minnesota. The document discusses several restoration challenges, from habitat suitability (“current land use patterns do not provide good quail habitat”) to lack of a genetic source population of wild birds. On this latter point, the report states, “Minnesota’s wild bobwhite population is likely extirpated, or nearly extirpated. Game farm raised domestic quail may persist in the wild for brief periods of time, and 2014 Minnesota Department of Natural Resources records show that 34 shooting preserves in the state offer quail hunting, and 25 licensed game farms raise over 13,000 quail annually.” Bobwhite quail are also offered on the Internet for sale in Minnesota, and one can buy adults, chicks, and fertile eggs from many dealers. No funds are available from the Fish and Game Fund for a bobwhite reintroduction program or quail habitat improvements, although Quail Forever used Minnesota Legacy funding to acquire habitat in southeast Minnesota for quail. Consequently, management of the Northern Bobwhite in Minnesota is an activity in progress. Chesness, Robert A. 1964. “Minnesota’s Bobwhite Quail.” Loon 36: 60–61. Eckert, Kim R. 2004. “Proceedings of the Minnesota Ornithologists’ Union Records Committee.” Loon 76: 39–45. Hertzel, Anthony X. 2003. “The Northern Bobwhite in Minnesota.” Loon 75: 3–7. Leopold, Aldo. 1931. Report on a Game Survey of the North Central States. Madison, WI: Sporting Arms and Ammunition Manufacturers’ Institute. Millard, Steve. 1981. “Bobwhite in Rock County.” Loon 53: 167–168. Sauer, John R., James E. Hines, Jane E. Fallon, Keith L. Pardieck, David J. Ziolkowski Jr., and William A. Link. 2014. The North American Breeding Bird Survey, Results and Analysis 1966–2013. Version 01.30.2015. Laurel, MD: U.S. Geological Survey Patuxent Wildlife Research Center. Swanson, Gustav. 1929. “The Quail in Minnesota.” Flicker 1: 33–34.